Fakes or copy knives is not just a modern problem. It’s been a problem always. It is also a very complex problem to distinguish what is a fake product and what is a similarity. If it is called a SAK style knife then we cannot say it is a fake, but if it is called a Swiss Army Knife and made in another country without authorization then it is in the danger zone. 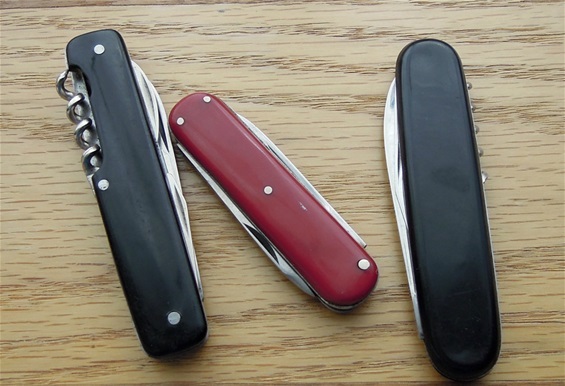 If a copied knife should have Victorinox or Wenger on the stamp + a Swiss Symbol on the scale then it is a fake. The biggest problem today is not all the knives that people have misunderstood to be a genuine knife or all the SAK style knives made. The biggest problem is in the future! The problem today is that knives are being copied and foreign manufacturers see themselves as competitors to the Swiss made knives. It is far more complex today with the legal systems and laws in the modern world. It is also a problem with the use of more modern production methods that can make fake or copied knives in extreme numbers. The quality is always less even today but it would be possible to make a quality very close to the Swiss knives if they want. This would cost more and the profit less for them. The Swiss have already made a modern SAK with probably the best production possible. It is a limit to how developed a knife should be. It is already close to perfection for what it is intended for. We know in history the souvenir problems and knives made by different manufacturers and all the knives called Swiss Army Knife style. It is no doubt that all the fake knives in the world cause big problems for Victorinox and Wenger. It is no problem for us enthusiasts to distinguish a fake knife when it is in our hand. This is usually always the case from pictures as well. The problem is what changes this is going to have for the genuine knives. There is a problem that I see with the foreign markets competition with knives compared to the genuine ones. If they make an extreme amount of knives that is very similar to the real product and they do not use any Swiss stamp or emblem then this is very difficult to call it a fake. Thus this product is now a competitor on the world marked under multiuse knives. Many would choose this product for advertisings or store-chain purposes. Then this is a big problem! No matter how people twist and turn on the history of knives the original or genuine Swiss Army Knives are an icon in itself. It belongs and should only be known as a Swiss product. 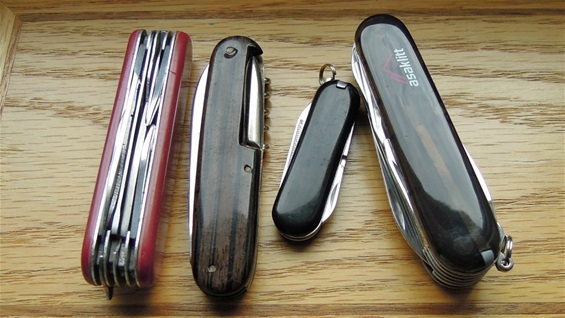 The big advantage with the competition between Victorinox and Wenger in history is the amount of functions and knives made. It was a competition of Quality! What we may have in the future is the competition of the Victorinox new global brand and all the loopholes knives made. Then we have quality on one side vs less quality and this is not a good situation at all. I am very sure in my case when I say the merged Victorinox and Wenger total product lines represents 130 years of history and it is a world icon with quality. I am also sure that Victorinox will use the values and that the quality will be used to explain the differences compared to the foreign products. We collectors and enthusiasts may have a few ideas on how the quality could be even better. In general we are very happy with the real products. A real Swiss Army Knife got a presence by itself that the fakes do not have. A genuine Victorinox or Wenger knife with advertising or name gives a quality impression. To receive a not real product will never be the same. On the picture is just a small selection of some knives that is not made in Switzerland. Most of these are part of history and does not represent any special problem. Many would discuss if they could be called a knockoff at all. The modern problem is far greater than these. The use of foreign advertising knives has already been used for decades but it is probably nothing compared to what may happen. We live in a world today with extreme amount of less quality products in all kinds of life. Sometimes it is better to buy one quality knife and not 5 lesser ones. In many cases the fake knives are cloned as best as they can and put into production. They use a different color on the handle and no Swiss Symbols. This is robbery! Every store-chain or sports magazine got a responsibility about the products used in the multiuse or versatile knife category. If you study the world history of knives then most would say that a multiuse knife is not a new invention. It is extremely old for sure. But there is also no doubt that the symbol of a versatile iconic knife is Swiss. This started in 1897 with a superb patent and today the products are used as a high quality tool and a symbol of versatile use in the world. Everyone immediately recognizes the little red tool. It is for me negative that a fake product is used in safety, outdoors or in the sports category range or used as a symbol for survival. It is not nice to see a low quality knife advertised as a knife for survival because this may have big consequences for the user. It is absolutely not so that the foreign competitors make a product that have the same quality today, it would be a long way to go to make the same quality. We SAK enthusiasts do not compete in who is the best SAK collector or user. We all have a little part with talking about the products. There are even some collectors of fake knives and believe it or not this is important for sure. All over the world there are people that modify SAKs and call then MODs. This is not a problem and in some cases it is needed. It can be a problem for the factories in some cases. It is difficult to find new words or explanations for what a fake is. I see it as a way of making profit on a low quality item. It is important that advertising knives or outdoors products got some quality in them. They can never have the same symbolism that the real ones even if they try to make the impression of it. The problem with fake knives is not only that the products may be cloned but also that the symbolism of a versatile SAK is being copied. On the picture above are some more foreign products. One of them is a bit extra special for sure. It is too easy to say that some products are just made with some level of quality to be used as a helpful tool for people that do not care about the origin. No matter on how one would twist and turn they are made to be similar to a Swiss product and in some cases cloned on some parts. It is absolutely so that some store–chains and places that sell them does not even know what they have. They are not bad people always. I am not going to dwell on the products on the picture because they are made and that’s it. The problem is in the future and that it is important for the world to know the truth behind the products they buy. It is not always the case that a clone-looking or a similar knife was made with the intention of being a knockoff or an easy profit product. It is so that the Officers type knife is an old patent from 1897 and that there must be a reason for how patriotic one should be. It is a complex situation with the foreign knives. It is not for a joke that the values: iconic design, functionality, quality and innovation are so important. These a key features in a philosophy on products that must be used against the fake and copy knives. We must take into consideration and mindset that we must live with competition from foreign markets but there must be some rules and laws. It is so that some functions used on real SAK are older than Victorinox and that they too have borrowed from history before 1884. I agree but there is a difference and this is that Wenger and Victorinox made it happen and they own the symbol of the SAK. They also own patents and products that should not be pirate copied! No matter on how people twist and turn the truth is 130 years of real history and products. 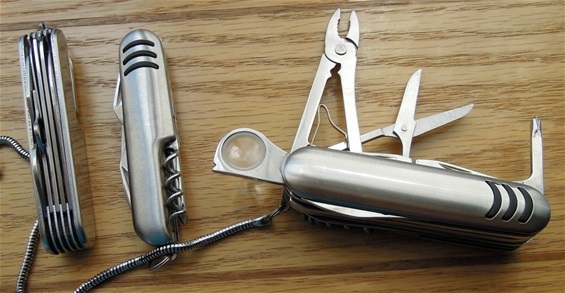 It is false to use a fake knife as a symbol of a versatile SAK product. 1. The cloning: - This can be the complete tool or parts. It does not necessarily mean traditional functions. If all the factors mentioned above are present then it is 100% a robbery. Non of the knives above does fit all four but fragments of them. I just call some of them knockoffs. The invention of the special spring system by Carl Elsener represents a superb invention. It would be to thin today to call a foreign knife a fake if it got three functions on a spring and it resembles a SAK. Genuine Wenger knives with personal ordered engravings. The problem with different foreign knives made around the world is the demand for a product. It is not always so that a product is made or in some cases cloned and then sent out to the world in huge numbers. There is a demand for such a product by different companies in the world. 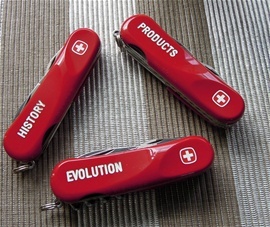 In many cases these products are different and cannot be called a fake unless it is called a Swiss Army Knife. It is not easy to navigate with all the products made but I do believe many companies in the world have a responsibility to check the product they buy and how it is presented. It is so that the original and genuine Swiss knives got an evolution. This we collectors know well and there should be no reason for a manufacturer to clone. It is many times interesting to look on a fake knife because if the fake manufacturers do clone a knife or parts then we can actually make an impression of what original knife it was cloned from and what knife. This is the advantage of knowing: products, history and evolution! In some cases the manufacturers of fake knives could say but the patent date is out! Then I would say: if you are a competitor of knives then why not make one without cloning. For me it is another indication of a manufacturer or demand by a company to get a product that is so similar to the real knives to capture SAKs versatile looks. On the picture above and on the side is a knife that cannot be called a fake because the construction and functions are not making any impression of being Swiss. They all try to use the versatile impression that a SAK construction and knives have. Some more not real knives above. One of these could be called a fake if it had not been for the tang stamp. It is important to remember that the philosophy behind the original or genuine SAK is to have quality. This cannot be sad about the not real ones.